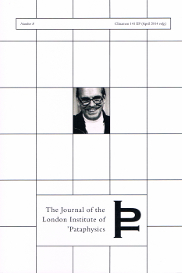 The EMC is proud to distribute two limited edition issues of The Journal of the London Institute of ‘Pataphysics, devoted to John White on his 78th birthday. The first issue, no, 8, is Albus Liber I: Exploits and Opinions of John White, Composer. The central work is Dave Smith’s catalogue raisonée of White’s music, which he has been collecting for decades. This catalogue is not merely a work list, but also a travelogue through the music of the founder of British minimalism, including comments, reviews, and other material. This lavish work begins with an introduction by Gavin Bryars. It is abundantly illustrated throughout. Additional input by Alastair Brotchie, Sally Child, Christopher Hobbs, John Lely, Antony Melville, Tanya Peixoto, and John White; and citations from the works of Virginia Anderson, Gavin Bryars, Michael Nyman, and Sarah Walker. Issue 9 is Albus Liber II: The Music of John White. This issue contains two CDs of previously unreleased music, more than 140 minutes in all including classics such as “Gothic Chord Machine”. These two issues of the Journal are published as companion pieces and are only available to buy as a pair. £30 plus p + p from the EMC. For information, see our Catalogue.